Even now, as I sit in my office at school trying to wrap up this story before the next one starts, I wonder: can she do it? I’ve been saying all along that I’m putting the accommodations in a separate post, which has now migrated into a post for all the hotels/hostels for both the February *and* the March trips, so all I have left is the final day and a half of Dubai. I used to think keeping a blog was a breeze, what could be so hard about just getting your thoughts and experiences out there? I’ve written about a million papers for school and those require reading and analyzing and research and thinking. I’ve written works of fiction that require creating worlds and people and events out of nothing. So writing stuff that actually happened to me personally should be a breeze, right? NO. Turns out, putting your own life and thoughts down in black and white is HARD, at least if you don’t want to sound like a rambling 5 year old. However, I think it’s a great experience — not just for sharing my tales and adventures with you (which is awesome, I love sharing), but to help me assess my travels, what I’ve done and seen and how it’s affecting me, to cement these stories in my mind by viewing and reviewing them, and to create something lasting I can look back on later. So thanks again for joining me for the ride. You keep me accountable to my writing and to myself even when I’m tired, busy, rushed or just not feeling it. Despite having been up till all hours at the Global Village the night before, I still had a full day planned. The tour buses start around 9ish, but I had looked at the map and realized that I couldn’t possibly take the tour bus all the way from the Marina to the Dubai Museum in less than 2 hours, so I opted to catch a taxi to my first stop of the day and then take the bus from then on out. As I exited the hotel in search of a taxi, a nice hotel employee asked if I was looking for a taxi and I said yes. A lot of hotels will help you flag down a taxi and some even have arrangements with the local drivers, so I didn’t think this was unusual. He said they had hotel taxis that had meters, reassuring me more than once about the meter. It turned out to be a meter that charged almost double what the city taxi meters did, so add that to the list of things I don’t like about the hotel. The driver also didn’t have a clue where he was going! It was like Saudi again, but I couldn’t believe this was happening in Dubai. I wasn’t even going to some out of the way place, I was going to the Dubai Museum, there’s only one. Fortunately this one at least had some concept of how to use his phone to find a place he wasn’t familiar with, so we got there after all, and after a brisk fare argument, I found my way into the museum. I love museums. I go to them whenever I can. I was lucky enough to live a short distance from the Smithsonian as a child which has given me a lifelong love even if very few museums in the world can quite measure up. I try to appreciate them for what they are. There were museums in China that had random artifacts open to the not at all climate controlled air and taxidermied animals that (up until recently) I thought must have been fake. 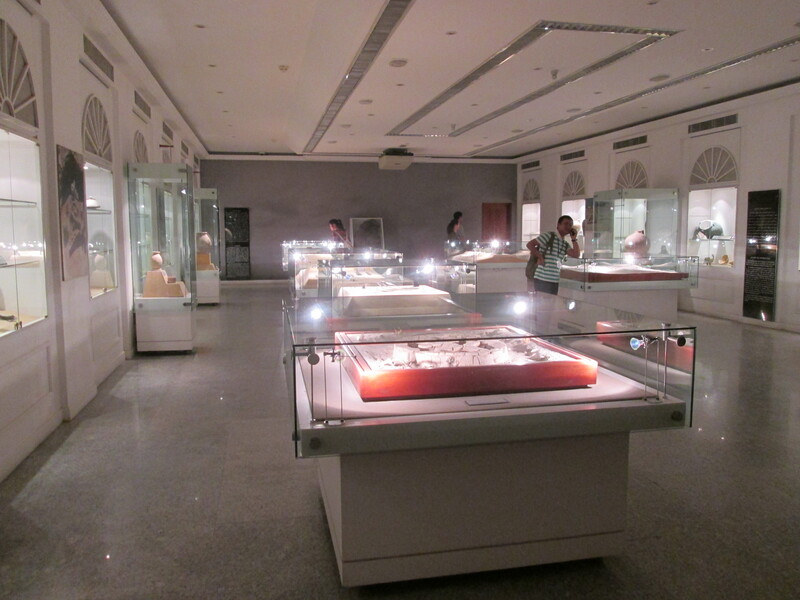 Given how BIG and glamorous everything is in Dubai, I had some pretty high hopes of it’s museum. How wrong can one girl be? And yet, this museum could have been built at the very first sign of the city’s transition from humble pearl diving village to richest, biggest show off and never again updated. I took a picture of the outside of the building in December, and I think that might have been the best view. The museum started off with an outdoor courtyard display of boats and a sort of palm frond and mud shack. There was some kind of art shop off to one side, but it wasn’t like original or traditional art, so I wasn’t really sure what it was doing there. Everything was small, cramped, old and generally the opposite of Dubai. I think my pictures make it look better than it did in person, because looking back at them I don’t remember being impressed at the time. It was also very crowded, a couple busloads of Chinese tourists had all stopped there at once. I finally found a door that led inside which took us to a spiral staircase down. Presumably the majority of the museum is underground, because it did take up more square footage than the topside appeared to. 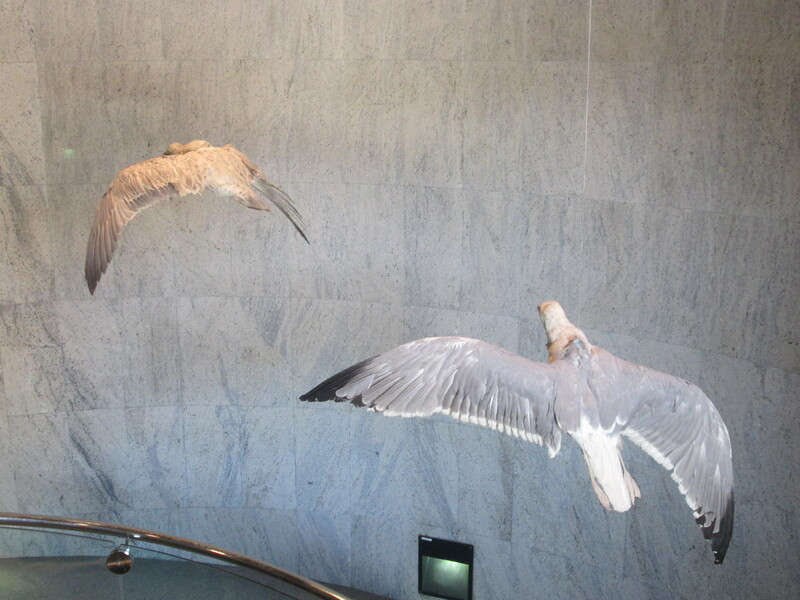 Hanging from the ceiling as we descended the stairs were several worn out stuffed seagulls. They were really quite pathetic looking, gray and dusty, feathers out of place and hanging at odd angles. As I looked down I saw that the floor had been painted to resemble the coastline and reasoned that the birds must be there to provide a perspective of flying over the beach, but I just couldn’t understand why these birds were so old and shabby. Dubai! Closer to the ground there was a dead flamingo in a similar sad state of taxidermy. There followed displays of Arab waxworks, but unlike Madame Tussaud’s, these were not great works of near human art. They were awkward and the displays seemed completely out of time, not because they portrayed the past, but because they did it in such an ungainly way. There were scenes of Bedouin drinking coffee, selling goods, at one point there was a blacksmith forge that had a little movie of fire playing behind the wax people. The ocean room was not too bad, a larger room that used a mirror on one wall to make half a boat seem like a whole boat. At one point there were glass sheets at different depths with fish painted on them to appear more 3D. 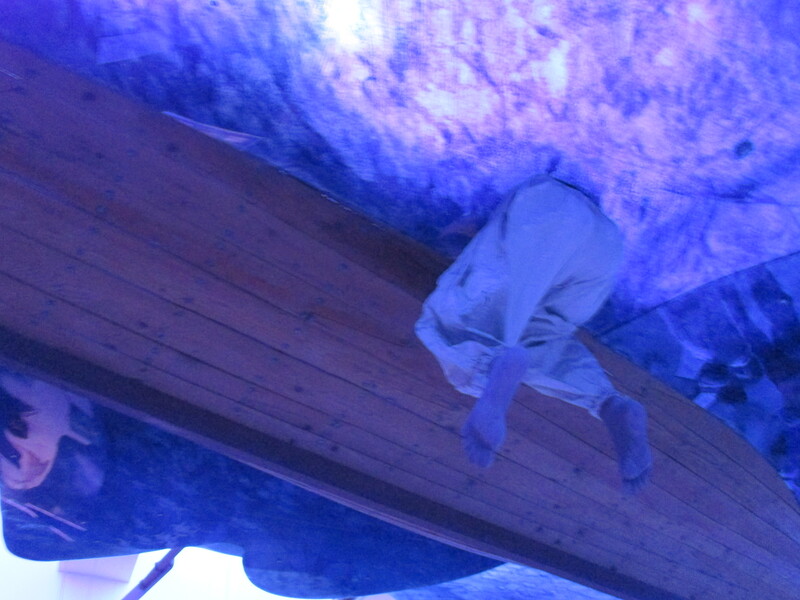 There was a waxwork pearl diver and a pair of legs coming down from the ceiling next to the bottom of a boat, as if we were underwater looking up. It sounds cool in concept, but the execution was just so tacky. There were more stuffed animals, desert foxes and other creatures, just as badly stuffed and cared for as the seagulls had been. And there were more wax people displays of nomadic life in the desert. All of this was cramped and close together with tiny aisles between the displays. It was very dark, so they displays were hard to see, and it didn’t actually take too many people before the rooms felt crowded. I don’t think I’ve ever wanted to get out a museum so much, but somewhere between the grotesque wax people, the sad stuffed animals and the claustrophobic rooms, I could not remotely enjoy myself. Dubai is a pretty cool city, with lots of neat stuff for people to see, but I was so disappointed in the museum. I can’t even imagine why the Saudi King has made an infinitely better museum in his capital than the Emir has made in his, but there you go. Score one for Saudi. My second morning starter having been so much less satisfying than my first, I plopped down in the air conditioned part of the bus and consulted my map. 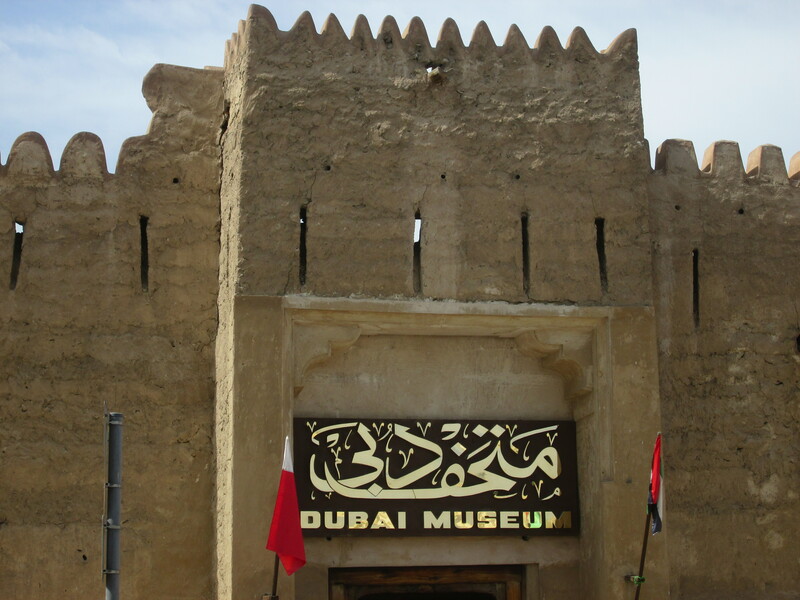 My next stop was the Heritage Village and Sheikh Saeed Al Maktoum’s House/Museum. I wasn’t too sure about this anymore considering how things had gone at the first Museum, but I’d seen the Heritage Village stop last time and it was definitely much bigger. 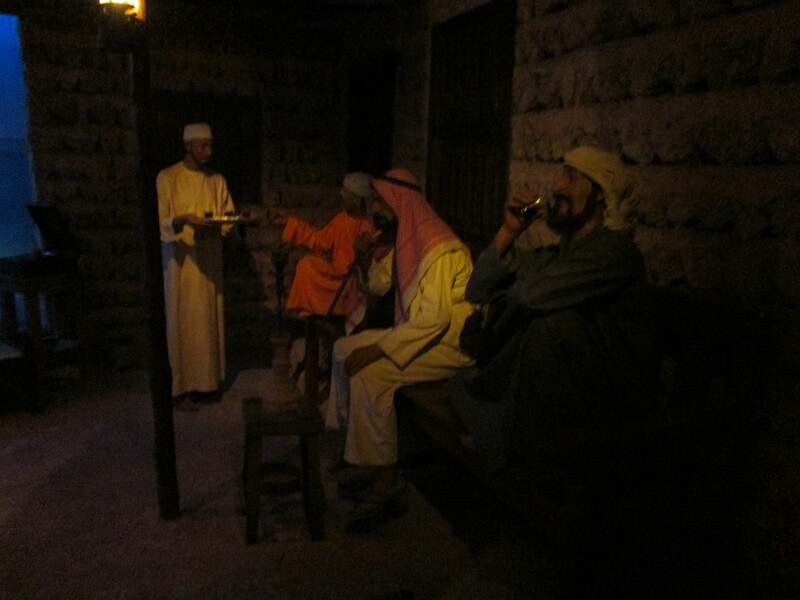 It had looked like a full recreation of an old style village, perhaps similar to what I had seen in Old Al Ula. Once again, I am about to be surprised at the fact that Saudi is doing a better job of historical tourism than Dubai. The bus had a stop or two before mine, and I glanced up as more people shuffled on and off, then I noticed that Urška had just gotten on and sat a few seats ahead of me. I called out to her and she was happily surprised to see me. So we moved closer and swapped stories of our evening before. I told her all about the Global Village, and she told me that she thought her husband was starting to feel better. We compared itineraries again, but it looked like the only stop we were both taking that day was the Heritage Village and after that we’d be parting ways. Still, it was nice to have company even if just for a little while. We got off at the stop and had to ask the driver for instructions on where to go more than once because again there were not clear signs. We found the entrance to the village, but it was pretty empty. It looked like maybe sometimes there were events there, people selling food or souvenirs, but there was nothing happening when we visited. There were some shops, a lot of buildings that just stood empty, and almost no other people at all. 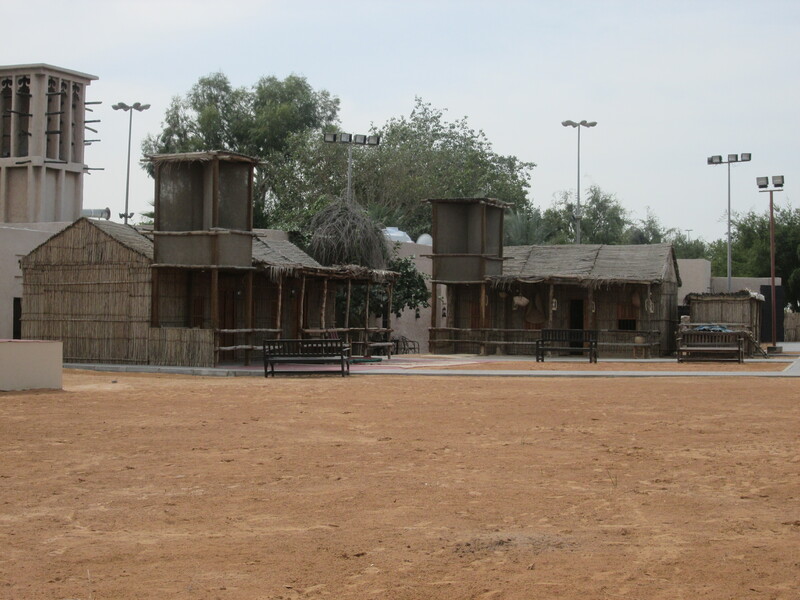 Maybe the Global Village had tainted my perceptions, but both the Museum and the Heritage Village seemed impossibly fake. I told Urška how strange it felt to be going to all these replicas of desert life, as though it were something from the distant past, when it’s still going on all over the Arabian Peninsula, and I had just been in the middle of it. We gave up on the village pretty quickly and went in search of the Sheikh’s house. This turned out to be a very beautiful, large building (former house) overlooking the canal. Inside we could see a multitude of rooms that seemed full of posters with quotes from the Quran (in English). There was a small theater set up in the courtyard where people could sit and watch the big screen television, but nothing was happening there. We found our way up some stairs to the second floor and were promptly invited into an office. I’m not entirely sure who the gentleman was, but as he was seated behind a desk piled with books and a computer, I assumed it was his office. He offered us tea and talked about the hospitality traditions in Islam. He seemed quite interested in having a conversation about Islam with us. I’m no scholar on the subject, but I know a bit, which seemed to make him happy. I can remember the first word and complete some of my favorite quotes. He talked about the importance of being tolerant to all religions (“to you your religion, to me mine” is a famous quote from the Quran) and slowly drifted over to the topic of offensive remarks in media. The Charlie Hebdo incident wasn’t that old yet, so I knew what he was referring to. It was not a subject I was terribly comfortable with. He said that people should not want to cause offense to others, that we should respect each other’s beliefs, and of course I agreed. should being the key word. People should love their neighbors, and not lie, steal, cheat or murder, but they do. Sometimes the government steps in, for example: theft and murder are both illegal all over the world. So he asked me why shouldn’t the government step in when it comes to religious tolerance and offensive speech. I tried to explain that although I agreed that respect and forbearance were the ideal behaviors, and that even most Westerners would agree with that idea, almost all of them believe it is a personal choice and not something that can be enforced. I really wish I could write more about these notions. How we view free speech, tolerance and respect as personal or governmental issues, but I’ve been avoiding posting anything about this topic because I don’t want my views to ever be mistaken for an insult to Islam. Also, by this time we were two cups of tea and a bottle of water into the conversation, and were getting restless to move on. We made some polite excuses, which were not at all false since we did need to be getting on for time’s sake, and took our leave of the gentleman. As we wandered further down the balcony, we came across several rooms that were filled with beautiful Arabic calligraphy. There were many different styles and little plaques that explained the details of each one. I’m afraid I’m not well enough versed in the varieties of the artform, but I really enjoyed seeing so many distinct styles. Islam does not condone the rendering of living things into art, so there are no pictures of the Prophet (PBUH) or any scenes from the Quran, or even any scenes of nature. But that does not mean that Islam is without art. 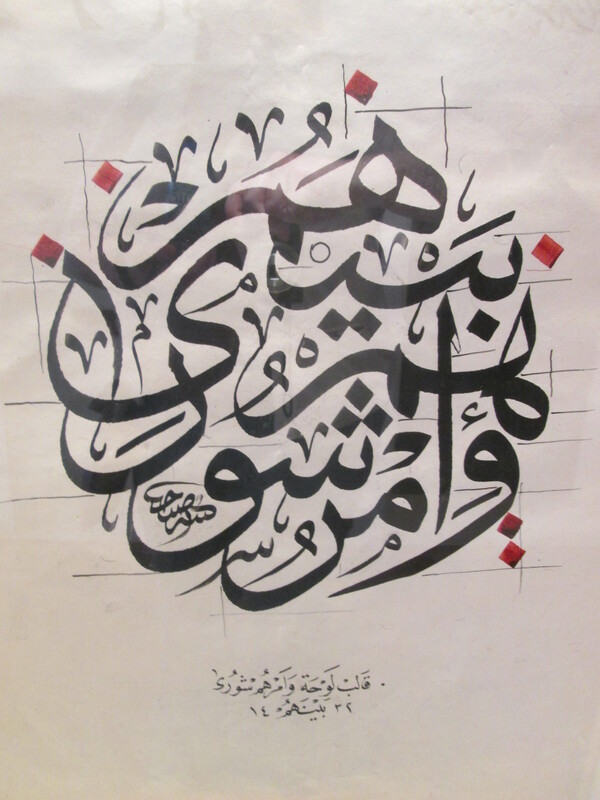 Beautiful geometrical patterns and stylized calligraphy such as we were looking at more than showcase the appreciation for beauty and creative talent of the Arab world. My next stop for the day was the famous Gold Souk. A souk (or souq) is simply the old word for a sort of jumbled collection of small stalls in a market place. In the past, many of these were not permanent. They would form only on certain days of the week or holidays, made of of some local traders, but largely of caravans passing through. Over time, some of the most famous became daily events, and some traders stopped hauling in carts and started building stores. Now, some souks are little different from strip malls or shopping centers while others remain more wild. Often there is a blend of permanent and transient shops. The gold souks are simply markets where all the jewelers congregate. There’s generally one in every Arab town, even Tabuk has one, although much smaller than the one in Dubai. Hopping off at the appropriate stop, I bid Urska goodbye and promised to keep in touch (which so far is working quite well). The bus stop was not in sight of the souk entrance, and I wasn’t entirely sure what I was looking for, but I was sure it had to be more than the meager collection of shops on the main road. After a few blocks and a couple turns and about a million people trying to sell me knock off fashion purses, I finally found the entrance. There’s actually quite a large gate emblazoned with the words “city of gold” so that was helpful. Once past the gate, it was hard to tell I was still outside. The streets were all covered over, keeping the pedestrians in shade, and no cars were allowed on the roads either. It reminded me of certain parts of the Balad Souk in Jeddah, except that every single window was full of tens of thousands of dollars of gold. I’m not actually a huge gold fan, I prefer silver jewelry, but there is something madly impressive about that much wealth just laying around. There were some truly amazing pieces in the windows, too: necklaces that could easily have covered as much of the front as a shirt, bracelets designed to cover the whole lower arm in gold, and even a sort of suit of armor made of gold. All the shops sell various purities of gold all the way up to 24 (although it’s hard to find jewelry that pure because of the softness of the metal). They sell men and women’s ornaments, as well as coins and bars. It’s all the gold. The main roads are wide, well marked and full of higher end stores (if you can use that for a place with all gold shops). There were also people wandering around with trays of cold beverages for sale (juice, soda, water) and the occasional vending machine, but there were no food stalls in between the gold shops at all. There were also a lot of barkers trying to attract tourists from the main streets to the shops off in the alleys. I actually had to get rather gruff with at least one of them who was being very pushy while I was still trying to get my bearings. But in the end, I found one who turned out to be helpful, so they’re not all bad. 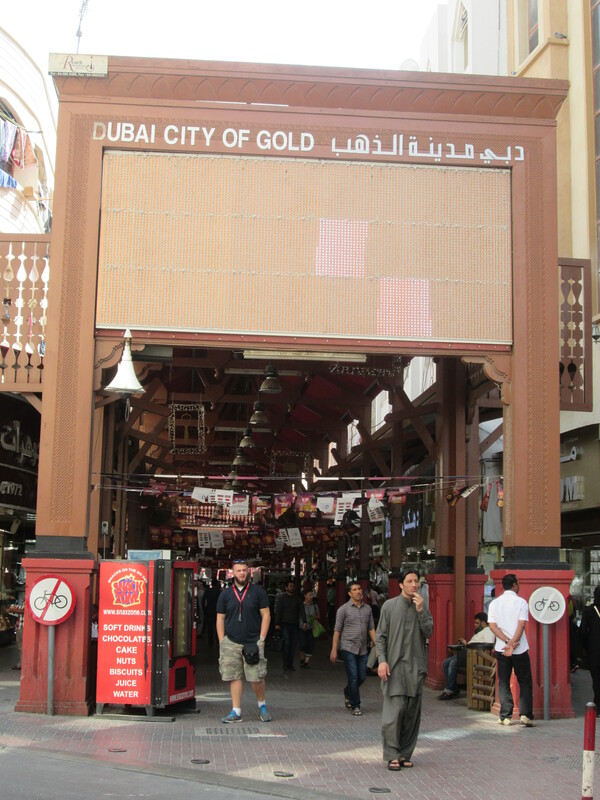 An interesting fact I learned about the Dubai gold souk: the day’s market prices are displayed on large digital posters all around the area and the shops are mandated by law not to exceed the market price. How, then, do they make any money, you ask? They add premiums for the shape of the worked gold. So the jewelry will be weighed, and that price calculated, and then depending on the type of workmanship, there will be an added premium. I was just there to scout investment gold, not jewelry pieces, so I was looking at coins and bars. Turns out it’s far more economical to buy in large bars than small ones. Not only are many shopkeepers willing to offer a discount on the market price if you’re buying a lot, but the premium for a single bar doesn’t change much whether it’s small or large. So if you buy a 2 10g bars, you’ll pay nearly double the premium than if you buy one 20g bar, even though you’ll pay the same per g market price. I also went around to several different shops to see what their prices were, and even though the market price is set for the day, the shops vary quite a bit in premiums, so it’s worth shopping around and asking for discounts. Most shops expect people to be buying small amounts, so I didn’t feel at all out of place even though I generally consider my own economic status sort of upper low class. Some of the shopkeepers looked at me a little oddly, but I think it was more for being a woman alone. Once I told them that my father had sent me, they all relaxed. It was definitely an interesting experience. I think even if you don’t want to buy any, it’s a once in a lifetime display blending extreme wealth and grimy back alley shopping. And hey, if you do buy, now you know how to look for a good deal. It was a long ride from the souqs to my next stop in Jumeirah and I had to transfer buses on the way. The transfer station was at Wafi, and remembering the bakery from the day before, I decided to stop and refresh myself. Touring is hard work, lots of walking, and I hadn’t eaten since breakfast in my hotel room. I decided that I could get something nice from the bakery and then sit on the balcony with a nice cup of iced coffee. I bought a small loaf of olive studded bread and a chocolate croissant. The staff were very polite and had no problem at all with my plan. When I asked for some butter to go with my bread, I was brought a little plate with two small covered pots. One contained the most amazing fresh sweet butter, and the other, an olive tapenade, which went just beautifully on my olive bread. The croissant was everything you dream of pastry being. Those things they sell in grocery stores as croissants are sad paper imitations. This was the real thing: flakey and chewy and crispy in turns, perfectly layered puffs and deep dark chocolate melted into the center. My latte was no let down either. Served beautifully, it was delicious and refreshing. Instead of granulated sugar, it came with chilled simple syrup on the side so I could sweeten it to taste. The earthy rich coffee perfectly counterbalanced the croissant while accenting the olive. There’s a small part of me that equates luxurious world travel with the slowly enjoyed outdoor cup of coffee, so no matter how much I want to see, I think that’s always an important part of any trip. Mosques are often quite beautiful. I visited the Floating Mosque in Jeddah and was not at all disappointed, so when I saw the Jumeirah Mosque on the tour route, I decided I would make it a stop. 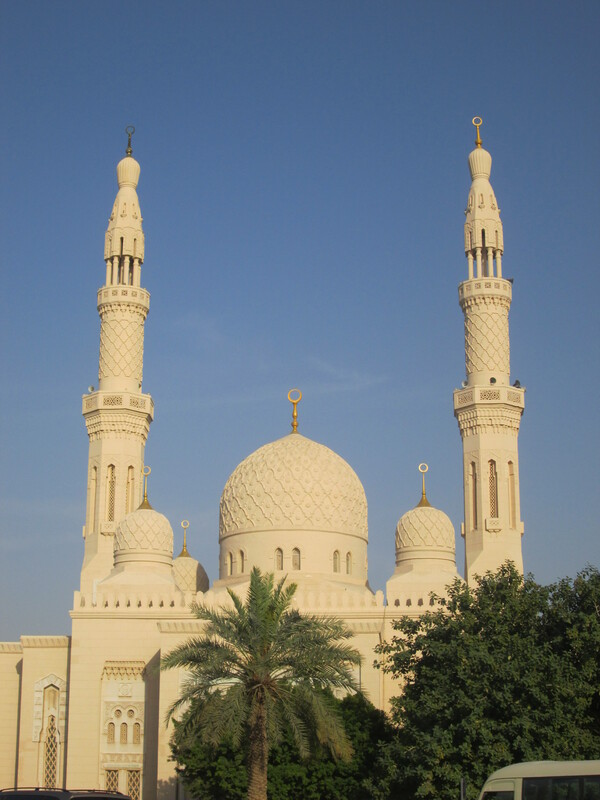 The Jumeirah Mosque is part of the “open doors, open minds” program. Typically, in the Middle East, non-Muslims are not welcome inside Mosques. I’ve only been inside one at all because I went in Seattle as part of a research project for school. This mosque is famous for being the only one in Dubai that is open to the public. However, it’s only once a day at 10am. I’m not sure how “open” that is, but either way, I didn’t get there until the afternoon, so I was relegated to the outside as with every other mosque. 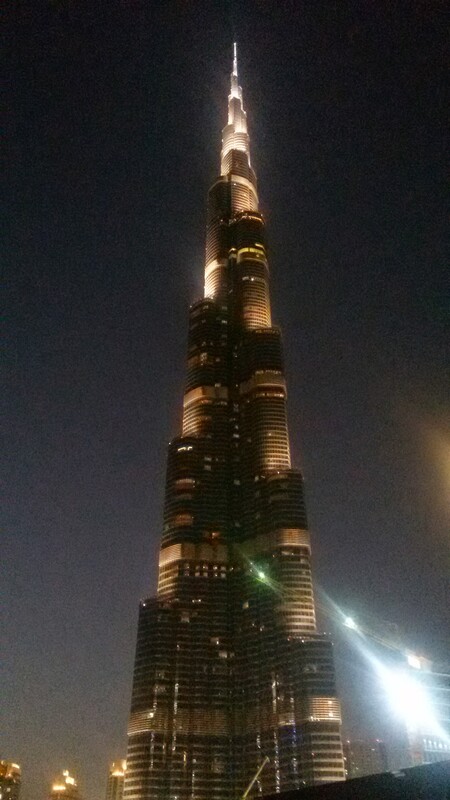 This is another one of Dubai’s famous landmarks. It is the world’s only 7 star hotel. There’s actually a helicopter pickup service from the airport for guests. However, after getting off at the bus stop and walking up the block and down the street, I discovered that no one can walk anywhere near the hotel without a reservation either for a room or for a meal, and the dinner minimum was several hundred dirhams. While I think that might be a worthwhile experience (similar perhaps to the Globe restaurant in Riyadh) the tour bus company did not provide the information in advance, so I had neither time nor budget for such an event, although the staff at the gate house did offer to call up to the restaurant for me if I wished. So it was that I took a couple pictures from a spot next to the security booth (where the staff pointed out was a great place to get a view) and headed back to the bus stop. I think if I go back to Dubai again, I’ll try to make it inside. I was impressed at how courteous the staff were even to passersby, and there was a cool water park there too that looks like it would be a fun way to spend a day before heading inside for a 7 star restaurant experience. I was starting to feel like my whole day was a little bit of a wash. Other than the gold souk, I’d pretty much been let down by or missed out on everything else I’d tried to see. Yet one more reason the Big Bus company really needs more info on their tour apps so their guests can get the most out of limited or scheduled events. When I had come in December, I caught only a few seconds of the famous fountain show, so I scheduled my last bus stop for the day to be at the Dubai Mall, which was not terribly far from the Burj. Except, I forgot to account for rush hour traffic. The fountain show starts at 6, but goes again every 3o minutes until 11, so I knew I didn’t need to worry about being right on time and tried not to let the traffic get to me. Soon, however, the bus was completely packed, and we were crawling along at less than a walking pace. My only solace was that taking a taxi would not have been any faster. There was a British couple in the seats in front of me that had tickets to the Burj Khalifa and I felt rather sorry for them, since although they’d left themselves over an hour to get there, the traffic was taking us far longer. I checked Google maps a few times, and realized that while the distance was slowly shrinking, the estimated time of arrival was not. It took us over 2 hours for what at any other time of day would have been 15 or 20 minutes. Future note, do not plan on going anywhere in Dubai during rush hour. I didn’t even see the metro running on the monorail above us the whole way. I did finally make it to the mall, and despite myself, the enforced rest actually seemed to have helped me. I’d been running non-stop all day, and I felt quite refreshed by the time I arrived. I was further bolstered by the snare of a fro-yo kiosk where I got a small bowl of peanut butter and chocolate swirl with nutella sauce. It’s spring break, I can have ice cream for dinner if I want. I got outside in between shows, which was nice because I had an opportunity to stake out a good viewing perch. It did mean standing for a while, since it gets pretty crowded, but it was worth it. The fountain is more like a fountain complex built into the man-made lake. The show is water and lights set to music, and as I discovered, if you wait around, each one seems to be different, so it’s not as if you catch just one show and take off. The first show I saw was set to Michael Jackson’s Thriller, and may have made up for the entire rest of the day. I caught the whole thing on video from my great seat too. After the amazing show, I went to find a bench and sit again for a while before deciding what to do next. Of course, I can’t go anywhere for long without meeting new people, and this was no exception. A couple of older European gentlemen asked if I could take their picture against the backdrop of the night-lit Burj Khalifa. I like taking pictures, and that building is soooo tall, that I crouched down to be able to get more of the building into the frame. This small photographic acumen drew comment from one of the men whose daughter did photography semi-professionally. We talked for a while about the industry, but I had to admit I’d been out of it for too long to know much. He was just as interested in my teaching, and asked if he could give my email to his daughter in case she had any questions about working in the Middle East. I was actually sort of impressed by the networking. I’m not a networking expert, or anything, but those guys probably had a whole rolodex of contacts for anything they could ever want. I was unbelievably tired, also hungry. Perhaps you have noticed that the only food I mentioned all day was a croissant, some bread and some fro-yo? It was getting late, after 9pm. The rush hour traffic was gone, so I caught a taxi back to my hotel. I wasn’t then sure of what my evening would hold later, but I knew that food and a hot bath had to be first. My feet were still swollen quite badly from several days of extended hiking and multiple flights, so I drew a bath while I waited for room service, and then indulged in another ridiculous luxury by dining in the bath. All of the other problems that hotel may have, their restaurant wasn’t one of them. The food was quite delicious and very generous. Even as hungry as I was, I couldn’t finish more than half of the dish I had ordered. I expected a full tummy and a warm bath to send me straight to sleep, but it seems instead I caught a light second wind, and decided to go out to the Barasti once again. It was Thursday night, after all, the end of the work week and beginning of the weekend, so I couldn’t pass up a look at another beachfront club. I had forgotten however that it was also Valentine’s weekend. Living in Saudi has made me really out of touch with “western” holidays, since they are all illegal. Without stores full of pink candy and red hearts, it had completely slipped my mind. 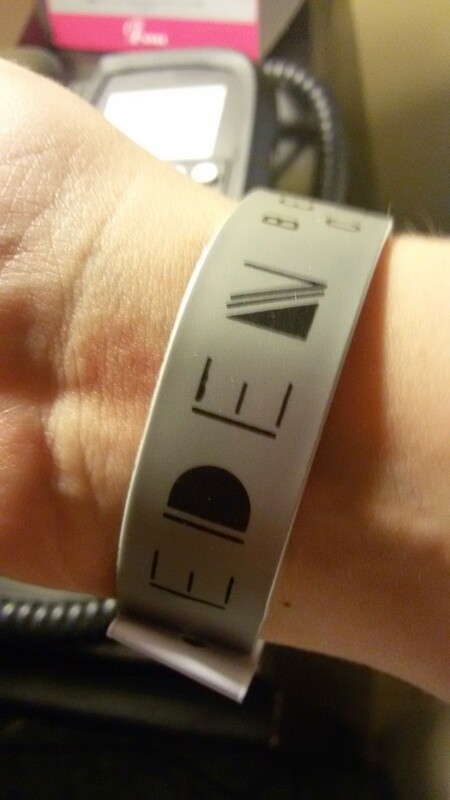 There was a bit of a line at the security check, but it seemed to be moving fast, so I didn’t mind. On my way up, I was approached by a young man who explained to me that it was couples night at the club, and he couldn’t get in without a partner, and asked if I would help him get in. I didn’t really see the harm in it so I agreed. We chatted amiably in line. He was from Syria, but had left before the current mess began. The security asked me how many we were and I replied two, pointing to the young man, and they waved us in. Once inside, we parted ways, for which I was a little glad. I didn’t want someone assuming “date” privileges just because I’d helped him get in. The club was crowded, but not oppresively so. I got myself a beer and walked around people watching for a bit. There was a DJ set up on the stage and people dancing in the sand. Others lounged around smoking shihsa from tall hookahs. Eventually I wandered down toward the water, where a security guard politely advised me not to go past the signs. I guess drunk idiots and open water aren’t the best combination. I think I was too tired for dancing, but the beach was nice and I was still glad to have come out. In the end, I spent most of the evening talking to the two security guards, one was from Africa and the other a former Soviet bloc country, but past that my memory fails me. I do remember that the Slavic man was actually living in one of the Emir’s palaces because the whole group that had been brought in for work had arrived before the accommodations were finished, so he was working at this beach bar shooing drunk tourists away from the water while living in a palace! Dubai! Fairly quickly my second wind died down and I headed back out. On the way, I got asked by about 5 more guys to help them get in, and several offered me drinks or money. It occurred to me if I was more awake, I could have partied pretty well just going back out for a new guy every time I needed a new drink. I think the Dubai night scene is great, but not after a week of non-stop sightseeing, so I have to add that to the list of things to do next time. So with a heavy heart and a deep sense of responsibility, I booked a flight for 3pm and did not go to a champagne brunch. However, since the dinner at Barasti was so delish, I decided that a beachfront breakfast would be a decent close second. I actually arrived a mere 5 minutes before they stopped taking breakfast orders, and got myself a “breakfast bap”, which is apparently a British name for a breakfast sandwich. 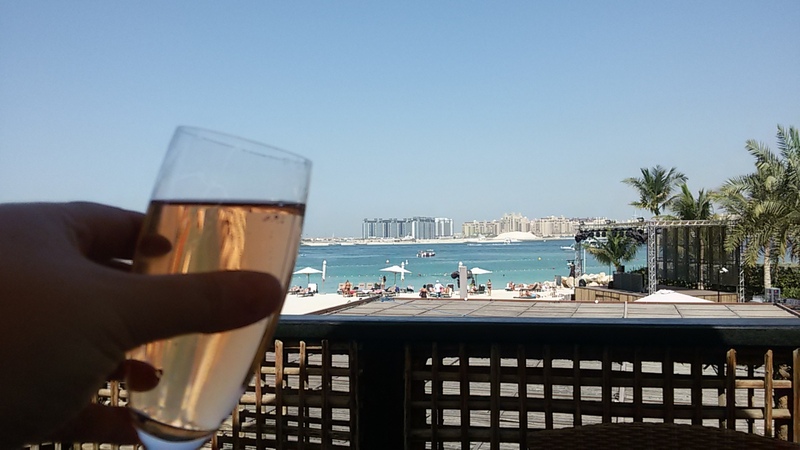 I also ordered a single glass of sparkling rosé, so I could do up Friday brunch a little more Dubai-style. The bap came with a polenta bun, on one side a fried egg and some kind of southwestern sauce, on the other, a pile of bacon and sausage. I’m not one of those expats who whines all the time about not being able to eat bacon in Saudi, but I have to admit, after 6 months without it, I really enjoyed my bacon that morning. There were also two golden rounds of hash browns. 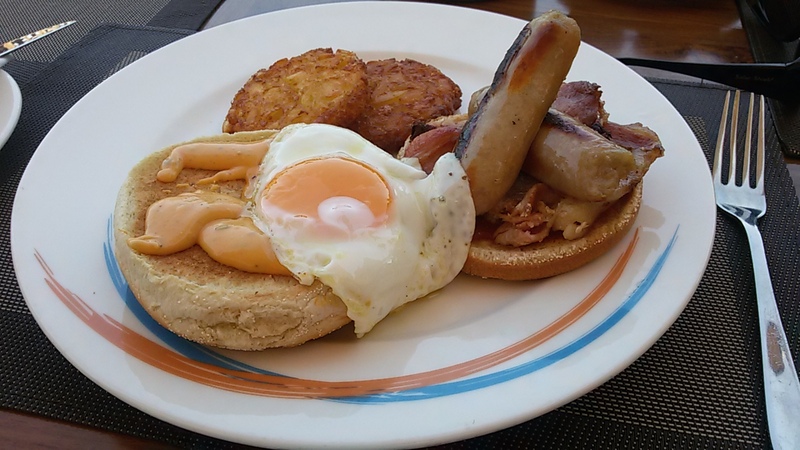 It could have been greasy spoon fare, but it was all done with a gourmet flair, and accompanied by a stunning view of the beach complete with swimmers and passing boats. It was the perfect farewell to Dubai and end to an amazing week. My flight out of Jordan was an overnight, so I got into Dubai around 9am. Knowing that my hotel was unlikely to let me check in until 2pm, I decided to take care of some shopping errands and check out the city’s fancy metro system. And boy is it fancy. I got a “day pass” for about 7$ so I could hop on and off at my various errands. The stations are all large, air-conditioned and very clean. There are shops with meals and snacks at reasonable prices. There are also separate cars for women (and children) only, as well as VIP cars for an extra fee. When I got on at the airport, the cars weren’t very full. A man who had started talking to me at the platform invited me to join him on the ride, but I went to the women only car instead. I’m really glad I did because the cars got just as full as any Beijing subway, and I did not relish the idea of being sardined in with a bunch of GCC men. The women on the metro seemed annoyed that I had a backpack, perhaps it’s a breach of metro etiquette to carry on large bags? I also looked really scruffy from my last two days in Petra (with no shower), but no one was outright rude to me. When I got off at the Dubai Mall stop, I soon realized that the station wasn’t actually all that close to the Mall. There is a 1 mile long skybridge that connects the metro to the giant mall with moving sidewalks and beautiful views of the city and the Burj Khalifa. I think on another day, I might have found this really cool, but after my Petra hike and overnight flight, I just couldn’t understand why in the world anyone would put a metro station a mile (about 2km) away from the main attraction of the stop. Reminding myself that finishing my shopping that day would free the rest of my stay for fun excursions, I stood sleepily on the moving sidewalks as tourists and shoppers used them to walk speedily by. I finally got to the hotel around 2pm. I’ll say more about that place in my accommodations post, but this was the fancy almost beach front hotel I’d gotten a 60% discount deal on, so I was pretty excited. They chided me for checking in “late” (between 2 and 3pm) and had already given away my room! To make up for this, I ended up in a 2 bedroom 4 bathroom suite. It was freaking huge. I think 2 families could have shared it. But the water was hot and the bathtubs were deep. I tossed all my laundry in the washer, and settled in for a cleansing soak. There is a serious problem with washer/dryer combo machines. They take FOREVER. Even after my bath and nap, it wasn’t done. I wanted to go out, but the hotels around the Gulf all require the room key for power. It took me a really long time to convince the front desk to give me a second key so I could leave the room with the dryer running. After some google searching, I found a beach front bar walking distance from the hotel and headed for it. 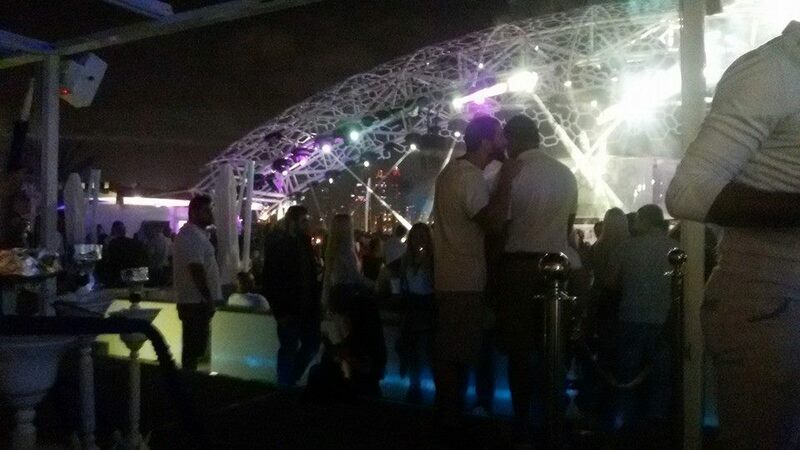 The Barasti Beach Bar was quite nice. There was a happy hour special and I got a frosty daiquiri and headed down to the lounge chairs on the waterfront. I chatted with some random Scottish dudes but they had to take off because the club was doing ‘ladies only’ from 6-9pm. Eventually, I spotted another lone guest and wandered near to say hello. She was quite open to company and we soon discovered that we were both from Seattle, our homes being only a couple miles away from each other! Maiya has a rather amazing story, but I won’t tell all of it here because it isn’t mine to tell, but here’s the gist. She was born in Bangladesh and adopted into an American family. When I met her she was returning from a visit with her birth mother in Bangladesh, which was her last, as her mother has passed away since then (send her family some good mojo, prayers and thoughts). All of the servers and cleaners at the bar were Bangladeshi and they were fascinated to learn her origins, and gently teased her about not speaking their language. We sat on the beach drinking too much and talking about our adventures until we were hungry enough to move up to the restaurant. (the food at Barasti is really good, by the way. I got a giant hamburger because I hadn’t had one in half a year, and she got a Cesar salad which actually had fresh anchovies in it). During dinner she told me about the village in Bangladesh that she had been born in, and how she came to be American, how she had found her birth family and been welcomed back by them. She’d started a non-profit organization to raise money for the schools in the village, for a playground, for materials, and for subsidies to pay the children so their families could afford to have them come to school instead of going to work. Turns out she’s a little bit geek too, so we bonded over some nerd stuff as well as our love of travel, and have vowed to get our next drink together in Seattle when I come home. When we finally decided to call it a night, it also turned out we were staying in the same hotel. So we walked back together and wandered into the Carrefour. My room had a full kitchen, so I decided I’d pick up some food for breakfast at the store instead of ordering room service. Maiya wanted to pick out some “exotic” candy for her son, who’s burning question for her travels had been, “Mom, what’s the candy like?” (this is pretty standard, I personally remember my childhood time in Japan primarily through the lens of strange candy). Seattle has a really good selection of imported candy, though, so this is actually a little challenging. Finally, I spotted some Kinder Eggs! For those poor deprived Americans among you who have never had one of these, I’m sorry. I remembered them with great fondness from my time as a child in Germany, and although I had seen a few places in Seattle with Kinder bars, I had never seen the eggs. I told her as much, so she got several for both her kids. I have no doubt that if they survived the flight, they were much enjoyed. It just never ceases to amaze me that we can travel around the world to meet people from down the street, and that everywhere I go, the universe finds a way to put amazing people in my path. Thank you Maiya, for sharing your time and your stories. I look forward to that beer in September! 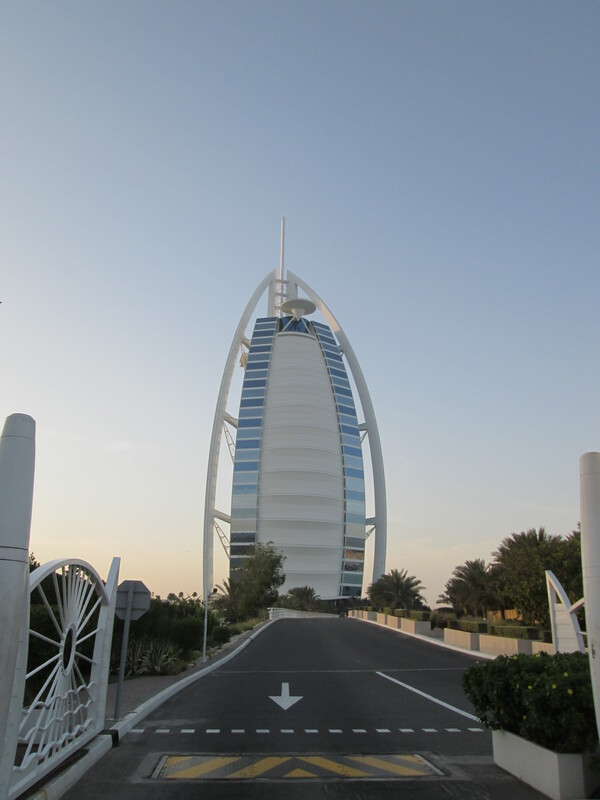 The first time I went to Dubai in December of last year, I got a one day pass for a hop-on-hop-off tour. It turned out to include many many admissions and attractions that I didn’t have time to do then, so this time around, I got myself a 2 day pass, and used the map from my first trip to plan out what I wanted to see and how best to get there. The new line that had been added had a stop just down the street from my hotel, and although the hotel had no idea, and there was no bus stop sign, I did manage to catch it anyway. I used their google maps feature to GPS myself, but even that turned out to be a little off. Fortunately, the driver saw me running for the bus and waited. My organizational brain has me considering writing a proposal to the company to hire me for a short term project to update all the information on their app with directions to and from each stop/attraction as well as photos of the stops that aren’t well marked. I can’t tell if this failing is in the company (which also operates in Europe) or just because the people in the Middle East haven’t gotten used to doing everything with a smartphone. Either way, I don’t think it would take more than a couple of weeks to ride to every stop and collect the information for future riders and it would sure make the trip easier (especially with photos for those who don’t speak English or Arabic). My first stop that morning was for the Marina Boat Cruise. Last visit, I’d done the Dhow Creek Cruise and enjoyed it, so I wanted to see another part of the city from the water. Sadly, the bus dropped us off only a couple minutes too late to catch the 10am boat, so I had to wait there until the 11am one. 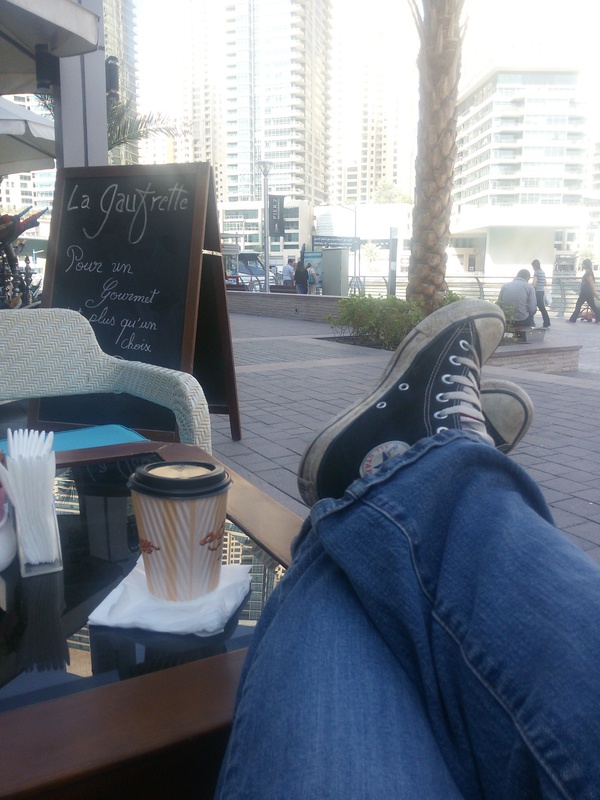 So, I found a cafe to get some coffee at and sat down to chat with an Irish man who’d been living and working in Dubai for several years. I’m still not sure where the actual native residents of Dubai are. I’m pretty sure everyone I met both times I was there was an expat worker or a tourist, but logic says they must exist somewhere. On our way back up from the docks to the bus stop, I noticed that one of the ladies had on my walking shoe of choice, the Converse high-top, so as I walked past her I commented, “nice shoes”. She looked a little confused, so I pointed at my own and grinned. We laughed a little and struck up a conversation. Her name is Urška and she is from Slovenia (where I now plan to visit later in the summer). She was also travelling alone, since her husband was back at the hotel and not feeling well. We compared our plans for the day and realized we were going to all the same stops on the bus, so we decided to hang out and be travel buddies for the day. 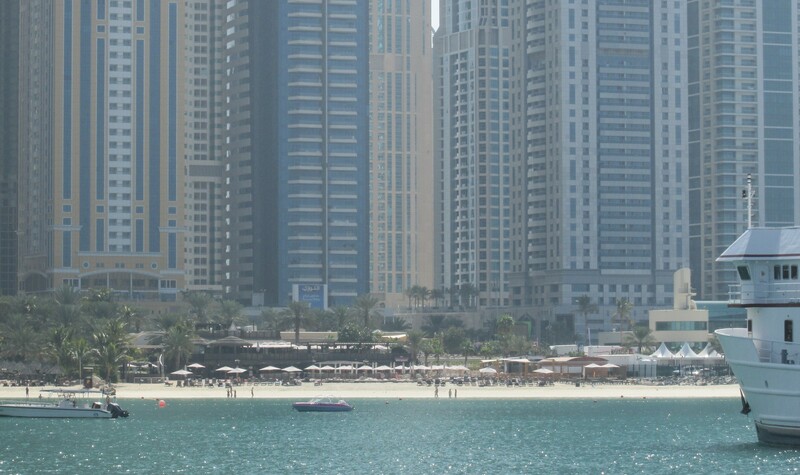 I had given some thought to stopping off at the JBR, or Jumeirah Beach Residence, because my students last term told me it was quite excellent. However, since my cruise had been delayed an hour, I no longer had time if I still wanted to do the aquarium and desert tour. But we did drive through the JBR on our way out to Atlantis. It was a very beautiful shopping district along the beach. I’m not overly fond of shopping, however, so while I was glad I got to see the famous area, I wasn’t sad at all that I wouldn’t be spending any time in it. 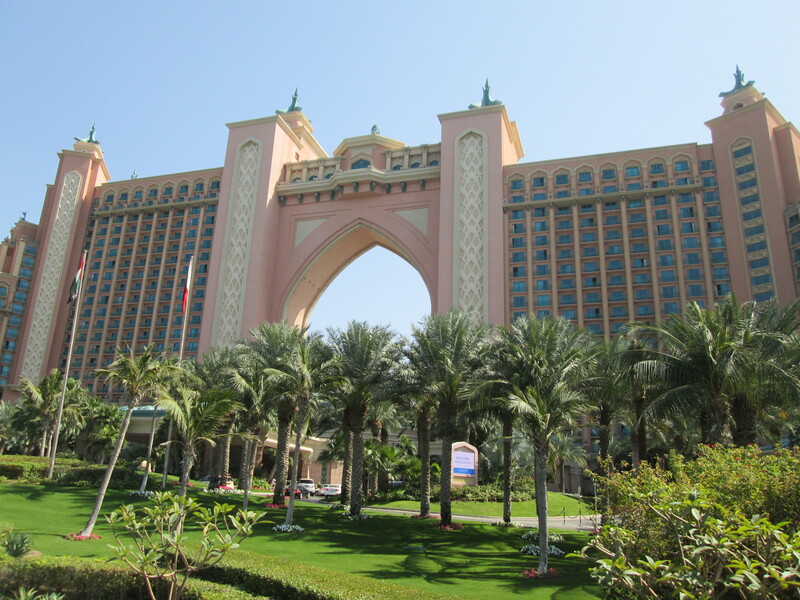 Atlantis is a branch of high end super luxury hotel resorts. It’s also one of the more famous landmarks in Dubai. It’s all the way out on the outter edge of the man-made palm tree shaped island and includes it’s own water park, a Dolphin Lagoon (where people can buy a visit with the dolphins), a plentitude of shops and restaurants, and the Lost Chambers Aquarium. Our ticket to the aquarium was included in our bus tour ticket, so Urška and I snapped our landmark pictures of the hotel as we drove up, then disembarked to check out the aquarium. It was a little tricky to find our way from the bus, since we had to stop at the Big Bus stand to trade our bus ticket stubs for an aquarium ticket voucher, then again at the aquarium ticket office to trade in for an actual ticket. I read a lot of reviews about the aquarium before I went, and wasn’t really sure what to expect. Dubai has a tencency to do everything over the top. I’d already seen the huge aquarium tank in the Dubai Mall, and several reviews said the displays of fish weren’t all that at Atlantis. That’s sort of true, but incredibly misleading. The Atlantis aquarium is Atlantis themed. It’s less about showing off a variety of marine life (as you might expect in a normal aquarium) and more about creating a sense that you’re walking through the ruins of the sunken city of Atlantis. We started out at a large cylinder full of silver baitfish, the ones that travel in huge swarms in the sea, flashing silver as they all turn in unison. The tank was lit with blue light and the fish circled endlessly, like a living lava lamp. Unfortunately it was too dark for me to get a good picture, but Urška was kind enough to share hers (credit!). Then we moved into an area with some smaller displays, the backdrops were carved stones, like sunken ruins. As we steped into the first large chamber, we were greeted with a wall sized view of the main tank that we would see in several chambers from different angles. The room also had Atlantean relics, suits of armor, statues and some “technology” that looked somewhere between steam punk and sci-fi. We walked through a tunnel that was constructed of strange metal shapes and inhabited by lobsters, again giving the impression that we were walking through the ruins under water. The main tank contained much larger blocks, walls and pieces of buildings. There was also a huge cauldron in the middle that would burst up bubbles every few minutes, looking like the smoke of a sacrifice ascending to the heavens.Watching the variety of sharks, rays and other fish swiming alone or in schools through the ruins was enchanting. 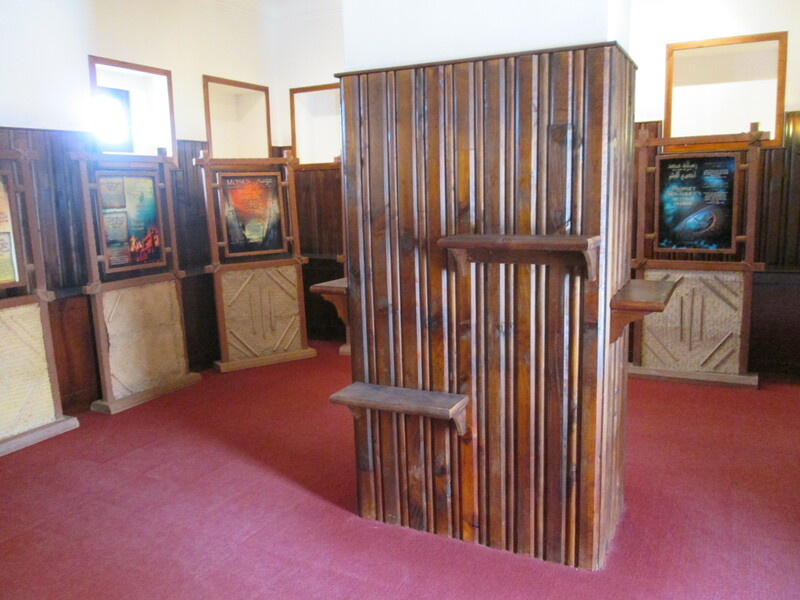 Each room had traditional Arabic seating on the floor in front of the display tanks allowing people to sit and enjoy the view without blocking those behind them. I took as many pictures as I could, but it was very dark, and I’m afraid most of them did not turn out well. Urška took some as well, and was kind enough to share them, so now I have double memories!. Room after room circling around the main tank and showed off smaller tanks full of mysterious ruins or imagined technology. Carvings of an unknowable alphabet graced many of the displays. There were vast vaulted ceilings and elaborate lamps and fountains. In one of the last views of the main chamber there was what looked like a small space-craft, or at very least an air-craft. So yes the fish are not much more than you could see at any aquarium, but the setting makes you feel like you’re walking through the ruins of that lost city. Definitly a worthwhile trip. Wafi is another one of Dubai’s high end shopping malls. 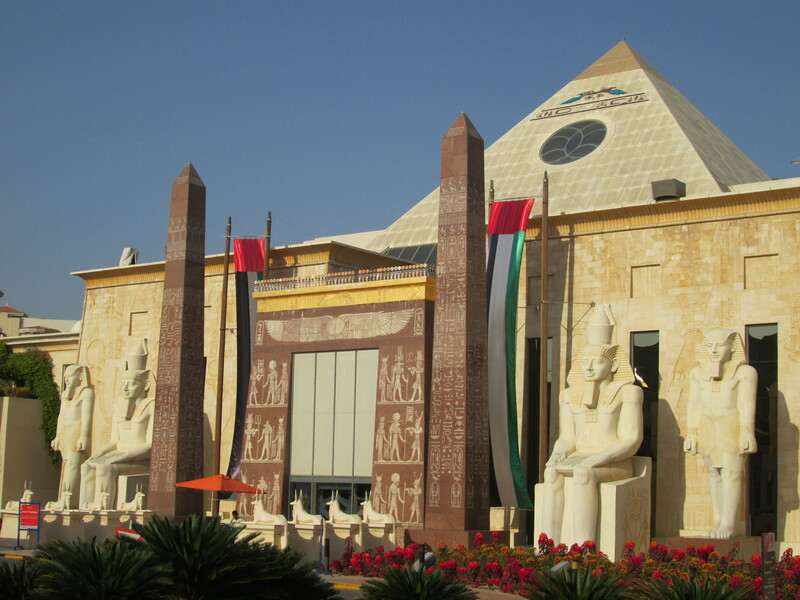 It has an Egyptian theme, so there is a large pyramid, and the outside is decorated with huge replicas of famous Egyptian statuary. At the bus stop itself is a beautiful little Arabic garden with all the lovely geometrical patterns, a fountain and pathways through the flower beds. We had only a short time before the desert tour bus left and we were ravenous. We ran into the mall to find a bathroom, but couldn’t see any fast food places around. Fourtunately, Paul’s (a fancy french restaurant chain) had their bakery open as well as their restaurant, so we grabbed some goodies from there to munch on the bus. 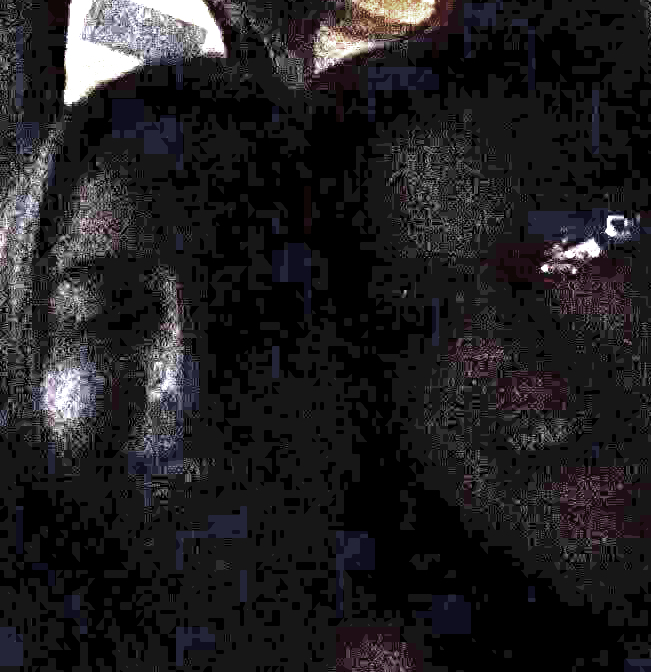 The bus was so full that by the time we got on, there weren’t two seats together so we split up for the ride. It took about an hour to get there, and the bus guide fed us little tidbits of information on the way. Among those was the fact that we drove past the villas where the Emeratis live, spending huge amounts of money to preserve their lifestyle of 50 years past. When we finally arrived, it was … a place that had clearly been specifically built as a tourist representation of a desert fort. It was almost comical after seeing the real ruins of Madain Saleh and Petra. It was like the whole village recreations of colonial or old west times that are found on the American coasts. There was a little red tent that we all passed through to be offered dates and Arabic coffee. I wondered for how many of the tourists here it was their first (or maybe only) experience with this tradition. After that, we all had the opportunity to pose with a hawk. There was a (ostensibly) Bedouin man who had a hawk perched on a sort of mit that he would place on the hand of each tourist while we posed for pictures. There were also camel rides, but like in a little circle maybe 10 feet (3 meters-ish) across. I did pose with the hawk, but did not ride a camel. As we walked up into the “fort” we passed a little meadow with some beautiful white (yes gray whatever) horses. The fort itself was full of more shops, mimicing the souq style with bins of spices and hanging skeins of cloth, but still selling tourist stuff. We picked up some complimentary juice and tried to avoid the sales pitches as we headed over to the seating area that faced west toward the impending sunset. 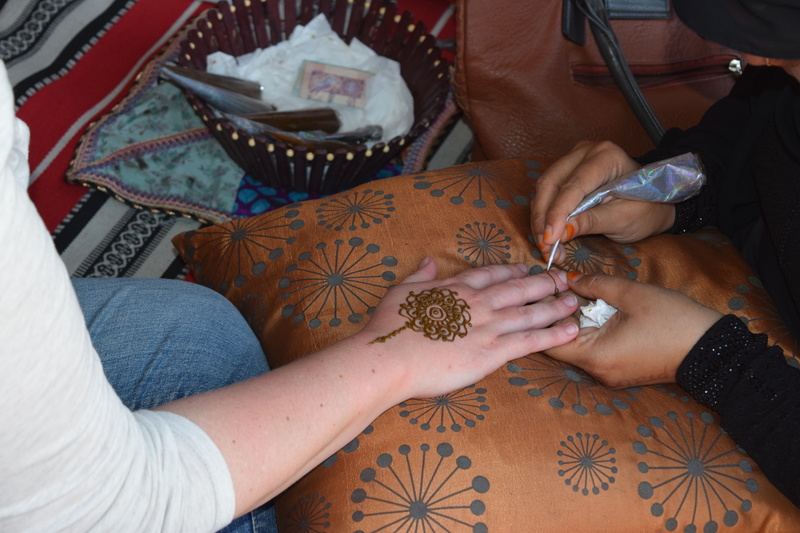 There was also a lovely lady doing henna hand art. It was included in the price of the ticket, but I did make a point of mentioning to the tourists around that tips would be appropriate. I somehow got to be an official photographer for a group of nordic tourists, which was kind of fun, and also gave me a chance to delicately let the others know that they should avoid showing her face if they took their own photos. I could tell a lot of the people there just didn’t know what the appropriate behavior was, being new to Arabic culture, so I was trying to find a way to let those who wanted to know know while not lecturing anyone on their behavior. She was astonishingly fast, creating detailed works of art, each one unique, in only a matter of minutes! I can only imagine how many thousands she must have done to be able to turn them out so perfectly with such variety. It was just as fun to watch her work on others as it was to take my own turn. With our hands hennaed, we sat down on a squishy cushion to await the sunset. As the sun drew nearer to the horizon, I suggested we walk out a ways and up a nearby slope for a better view. Each type of landscape has it’s own special sunset qualities. In Seattle, we get mountiain sunsets which are beautiful in a completely different way from desert sunsets. There’s something really cool about the vast flat horizon meeting the glowing orb of light. The dry air also changes the perception of color a little as well, giving a much more golden quality than pink or red. I think I’ll get tired of the desert a long time before I get tired of desert sunsets. There was also a little rivulet of water draining out from somewhere in the fort. 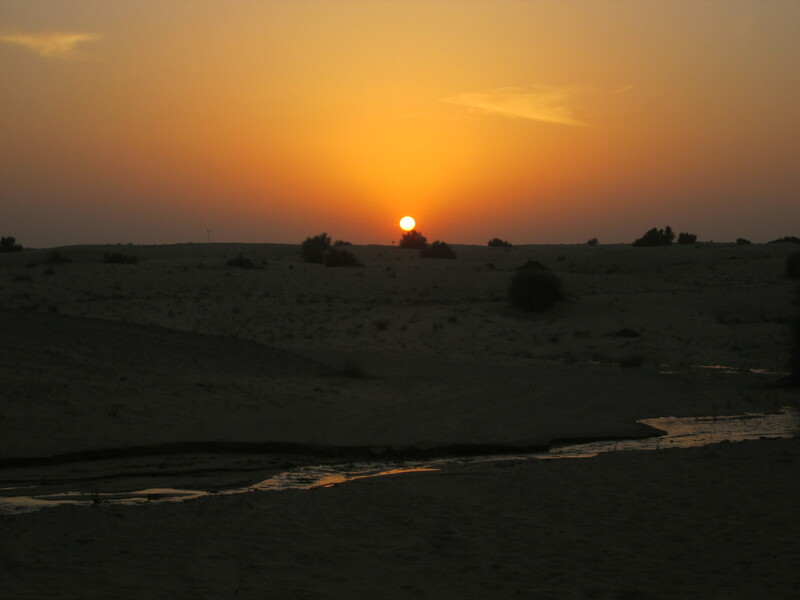 It created a tiny river that turned into a silver thread against the darkening sand as the sun sank lower and lower. Urška joined me for a duo-selfie with the sun right between us. I think it might be my favorite picture from the whole group. A lady friend from Facebook who lives in Dubai had given me a long list of cool things when I was planning my December trip and I obviously couldn’t do all of them then, so I put a few more on the list for this trip. One of them was the Global Village. I’d researched it last time, but just couldn’t fit it into the scheudle, so I was determined to make it out there this time around. 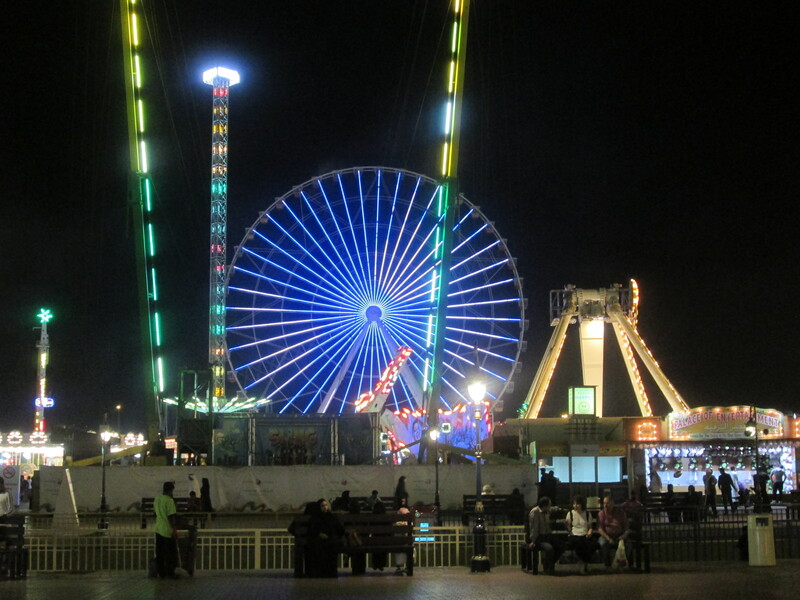 The Global Village only operates during the “cooler” months because it is mostly outdoor, or open air buildings. 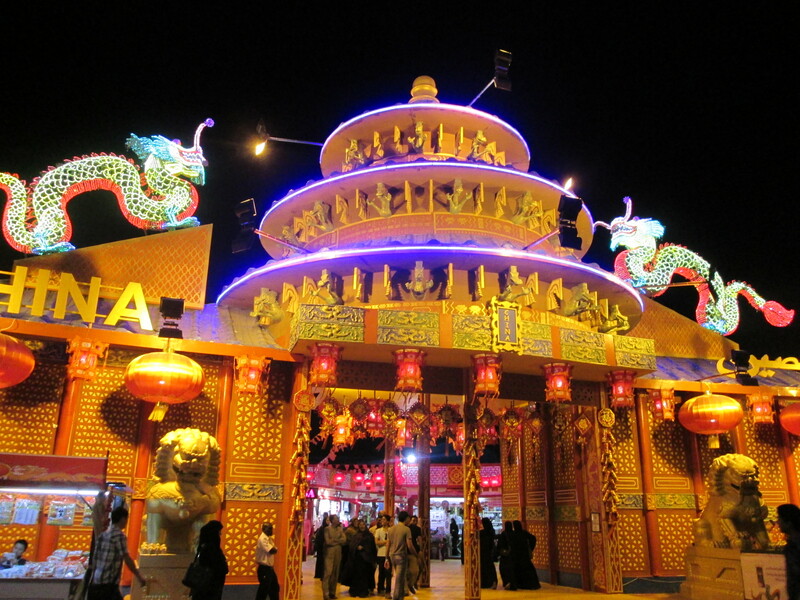 Each region or maybe country has its own pavillion with very … sterotypical national decorations. The only way I can really describe it is Disney meets Model U.N. It’s mostly a shopping place, but there are many restraurants, food kiosks, an entertainment stage and an amusement park. I really only meant to stay for an hour or two, just to check it out and not to do any shopping, but I ended up staying until after 1am! There was just so much to see! The entrance fee is actually really cheap, only a couple bucks. When I first came in there was a “Bedouin Camp” display. 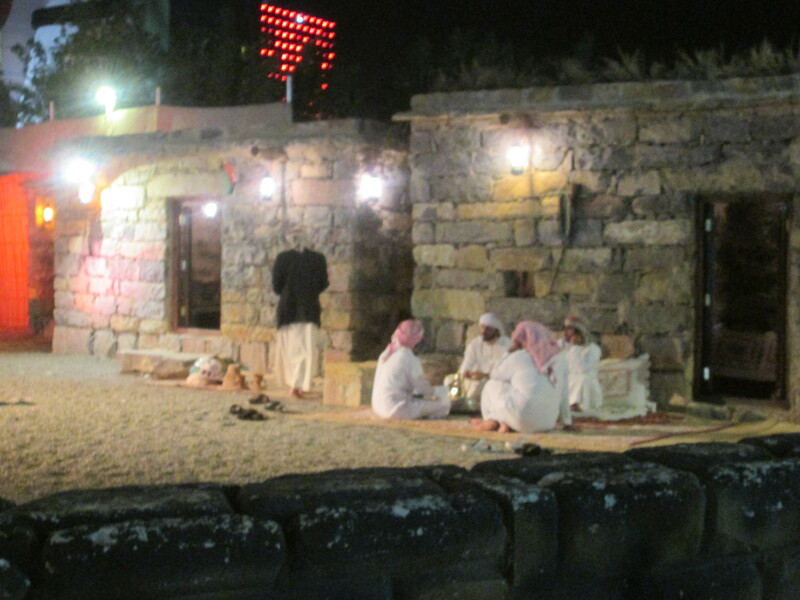 They had made a little brick hut in the desert scene and there were actually men dressed up in thobes and shemagh sitting around having tea and cigarettes but clearly part of the display. I moved further in to the park and saw a huge bright glowing globe off to one side, like the Epcot globe. I still have no idea what it’s for. 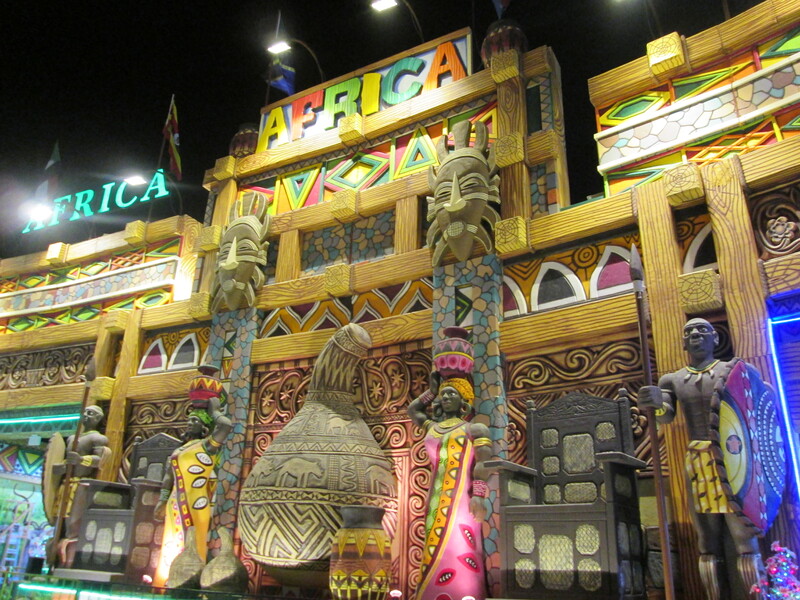 The first region I came across was “Africa” which somehow incorporated every sub-Saharan African stereotype ornament in one giant facade, as if designed by very un-PC Disney Imagineers. I went inside and there were rows and rows of tiny stalls, each saying the name of the shop and the country of origin. There didn’t seem to be anything country specific about the goods they were selling as there were booths with animal bone and hide ornaments, carved wood ornaments, jewelry and even Bob Marley/Rastafarian stuff (I guess slave colonies count as Africa, right?). I was greeted very quickly by a nice young man running a booth near the front. Maybe he was bored, or maybe walking around looking scruffy and carrying a backpack means you’re broke, either way he didn’t try to sell me anything, he just wanted to talk. He invited me to sit with him in his booth and we traded stories. I tried to help him with a few sales, but it was pretty slow. Since the Global Village is only active about half the year, all the shopkeepers will return to their home countries when it’s over each spring. Muhammad, like many people I meet travelling, dreams of a better life. He asked about improving his English, but I felt like his grammar was fairly good, so I told him to check out videos on voice coaching for actors learning accents. I’d had a long day, so sitting and chatting was nice, but I’d only just started to explore the village and soon had to move on. Next I came across China, which ended up looking like a cheap Chinese knock off of the Silk Market in Beijing. Of all the countries represented, I felt it was the most accurate at least in terms of how China represents itself to the world. I found one inestimable treasure however. Haw fruit! This small red fruit is very sour and I’ve never seen it anywhere outside of China. Some import shops sell haw flavored candy, but it’s not the same. One of the most ubiquitous treats in Chinese street food is the sugar coated haw on a stick. Among the food stands selling what is basically Middle Eastern fair food there was one stand that had a display that drew me in. I actually asked the shopkeeper about the haw fruit in Chinese, but I don’t think he heard my words, because he started explaining them in English. He got as far as “this fruit is called” when I interrupted with excitement. He was equally excited though, since I was the first customer he’d ever had who knew what he was selling. I explained about my time living in China and how much I loved the treats (in Chinese) and an Arab man who had also been standing at the booth blinked in bemusement and said (in English) “well, that was unexpected”. They were a little pricey, but I guess it’s not cheap to import a fresh fruit that has no real demand in an area. Yum! I wandered and wandered and wandered. I discovered that most of the pavillions were just full of shops, after the first few I stopped going inside them and just admired the huge facades that represented each place. Jordan, of course, was a smaller than life model of the Treasury of Petra. Egypt had replicas of Luxor. Cambodia showed off the beautiful temples. Some were more abstract. Kuwait was a scalloped pattern, I’m not really sure what was up with that. Europe was funny, sticking France, Germany, Spain and England together, but Italy got it’s own separate facade. I think there was a small Notre Dame. Spain was for some reason represented by windmills (which I have always seen associated with Holland). It took me a while to understand, but eventually I spotted a statue of Don Quixote and Sancho and it made more sense. I noticed that there was some dancing on the main stage so I headed over. They had a troupe of dancers doing what I *think* was a Turkish style (maybe Greek, there was some “opa” going on), but I only caught the tail end of the show. Here’s a link to a short video. There was an intermission and the entertainment resumed with a “Circus Circus” act, sort of a highly stylized dance routine with circus costumes and “acts”. They were quite entertaining to watch and I probably killed close to an hour between the two shows without meaning to. Around one side were some “pay extra” exhibits. Most of them were not terribly appealing to me, but there was one called “Illumination World” which caught my eye. So for a couple extra dollars, I was allowed in to see the array of larger than life paper lanterns. It was beautiful, but kind of funny to see what represented each country. There were mushrooms and butterflies for Holland, dragons and pagodas for China, the Sydney Opera House and boxing kangaroos for Australia and many others. The Middle East was represented by a scene from Aladdin’s Lamp, some pyramids, and of course… camels. France had a beautiful Eiffel Tower, and America was a Statue of Liberty… flanked by a cowboy and an Indian. No I don’t mean Native American, or First Person, this was super old-school red-indian kind of sterotype. That’s America: liberty, cowboys and Indians. Thanks Dubai. It made me curious, since I realized at this point that I hadn’t seen any pavilions for the western hemisphere. Asia, the Middle East and Europe were all well represented, and although all of sub-Saharan Africa was relegated to a single pavilion, they at least had something, but where were the Americas? I set off to find out, vowing it would be my last stop because it was well after midnight already and I wanted to get an early start in the morning. But I was hungry too, so I paused at one of the “heritage” food stands I’d seen around. It turned out they were making another kind of food I really love, although I did not know it existed here. Its a kind of huge crispy crepe made on a massive round skillet. In China, these skillets spun, but here they were stationary. The fillings were also different, I got egg and cheese where in China it would have been egg and vegetable. But it was really delicious and nice to find. It reminded me that I’d seen a similar wheel skillet in a shop in Tabuk and clearly needed to investigate further. Finally, I found the pavilion I’d been searching for (although I had to go to a reference map to do so). There was only one for the entire western hemisphere, and all of both North and South America were lumped together, seemingly represented by Brazil. The shops inside were clearly struggling with a theme and no surprise since there aren’t a lot of tourist type goods produced in North America and I guess they don’t really understand Latin America at all because there was just nothing from that country bloc. Most of the goods for sale were very generic and probably made in China for “American” companies, however there was a whole big store full of crocs (yeah the shoes) and that said a lot about our image overseas too. The main highlight of my birthday treat to myself was a champagne brunch at one of the most luxurious hotel resorts in Dubai. (ok it was Prosecco, I’m not complaining) It turns out that Friday brunch is the thing to in Dubai. If you’re ever there on a Friday, make sure you find one and go. See, Dubai is a little like the Vegas of the Gulf, and while alcohol is legal there (unlike in Saudi) it can only be publicly served in hotels. So these brunches, with limitless cocktails, wine, beer and bubbly are where people really let their hair down. I’ve heard stories that some of the more casual places devolve into riotous parties by the end of the three hour brunch tour. In fact, it was the huge array of brunch options that caused me to spend several days researching and weighing my options. In the end I opted for Al Qasr, located in Al Jumeriah. Three restaurants get together to make the brunch menu, and run from 12:30 to 4:00, slightly longer than the average. Since I wanted to have a chance to try everything without exploding, the longer time was important. The chocolate room didn’t hurt their chances either. I do not regret my choice in any way. First, as the taxi drove up, we passed by a beautiful lawn covered in more than a dozen larger than life golden Arabian horses (and some reindeer because it’s Christmas). Then as we pulled up to a beautiful building with traditional Arabic designs and more Arabian horses in the fountain. I spent some time wandering around taking photos before heading in, since I was about 15 minutes early. When I entered the building, I was completely swept away by the beautiful Christmas decorations that greeted me. I can tell you that there is nothing like spending some time in poor, dirty places to make clean, beautiful, wealthy places seem disproportionately more amazing. For example, my friend and I while travelling around China, staying in hostels and hiking up mountains were exposed to a wide variety of very … rural amenities. When we took ourselves to a night at the Tang Dynasty theater at a beautiful upscale locale, the bathroom nearly brought us to tears simply because it was bright, clean, private and had warm water to wash up in. So you can imagine, after living in Tabuk for almost 4 months, working at a school where the toilets haven’t flushed for 8 months, completely unable to clean the dust from my feet or abaya, looking at dreary taupe sand colored everything for nearly the whole time how seeing a huge, beautiful hotel would be awe inspiring. Even more so that I had been deprived of Christmas celebrations ( having only my own homemade paper ones to try to bring in a little cheer) how seeing soaring, sparkling, bedecked trees under twinkling chandeliers brought equally sparkling tears to my eyes. I took many more pictures of the building and decorations, little brass camels, antique silver samovar sets, Santa’s sleigh and flying reindeer, and many more things. Those along with the pictures I managed to get of all the buffet displays (before the people started chowing down) are all on the facebook page. As 12:30 arrived, the staff began to let patrons down the sweeping double staircase to be greeted by a table filled with flutes of pink prosecco and friendly servers handing each guest a brimming bubbling glass. Escorted, glass in hand, to my table on the patio of MJ’s Steakhouse (one of the three restaurants that blend together at Al Qasr to create the ginormous brunch spread), I passed such an amazing display of chocolates and pastries, as well as a a cheese board that made me wistful at first sight. I took myself and my camera on a quick tour of the three restaurants and their offerings. In addition to the deserts and cheese that I passed, there was a whole seafood area with a sushi station that could have been a buffet all on its own. There was Indian, Chinese, Italian, French, Creole, eggs and waffles, and some things I didn’t even recognize. All of it cooked or prepared right there in the three gourmet restaurants and served fresh. There were also buffet drinks stations. There was cognac, beer, a station making lynchburg lemonades, one of mojitos, and one full of fresh coconuts waiting to be cut open and have rum poured into them, and probably some I missed. Just like the food stations, one had simply to walk up and ask for a drink, mixed when you asked so those keeping Halal could know they could have a “virgin” cocktail. I started at the seafood stations (yes plural). 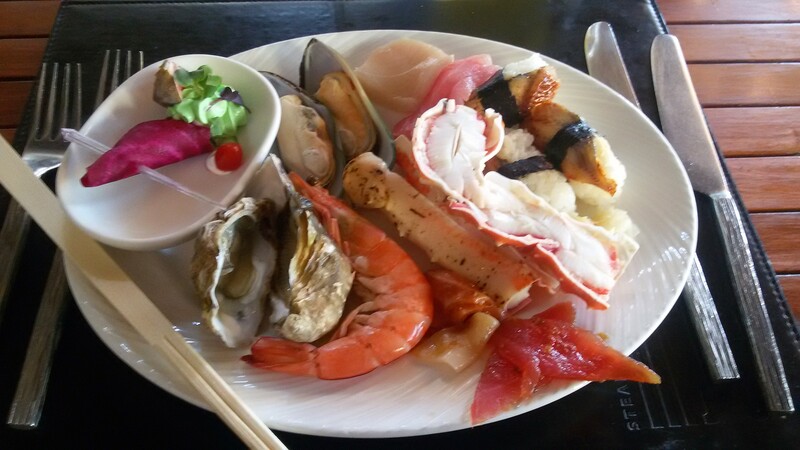 Seafood is one of my favorite categories of food, and I’d eat sushi every day if I could afford it. King crab is a delicacy I rarely eat, not merely because of the price but also because I think it’s crazy that people die catching food in the 21st century. But, there are things to be said for exceptions. Also, steamed mussels, raw oysters, boiled prawns, and sashimi salads were all on one seafood table (and on my plate). And from the sushi table, I focused in on the unagi (smoked eel, and my absolute favorite) and sashimi of salmon, tuna and yellowtail. I should also mention that the pickled ginger was top notch. Oh and that bright pink and green dish in the corner is lebnah (a kind of soft cream cheese/sour cream thing) with a thin slice of beet, a sliver of fig (which goes great with lebnah as I discovered) and the tiniest most adorable (and sweet/tart) cherry tomato I’ve ever seen. It should be obvious, but I’ll say it anyway, all this seafood was fresh, top quality and really delicious. I’ve had mealy shrimp and chewy mussels before when buffets (especially ones that expect you to be drunk) try to cut corners of the pricey food items, and let me tell you that Al Qasr does no such thing. My second plate was dedicated to the cheese board. I love cheese. I’m always scouring the cheese ends bin at Whole Foods to find tiny tasty tidbits of some old favorite or some new experience. Cheese, as you may know, is expensive. Even my friends who are fully financially secure treat good cheese as a luxury which they buy in tiny slices and serve with matching fruits and wine. 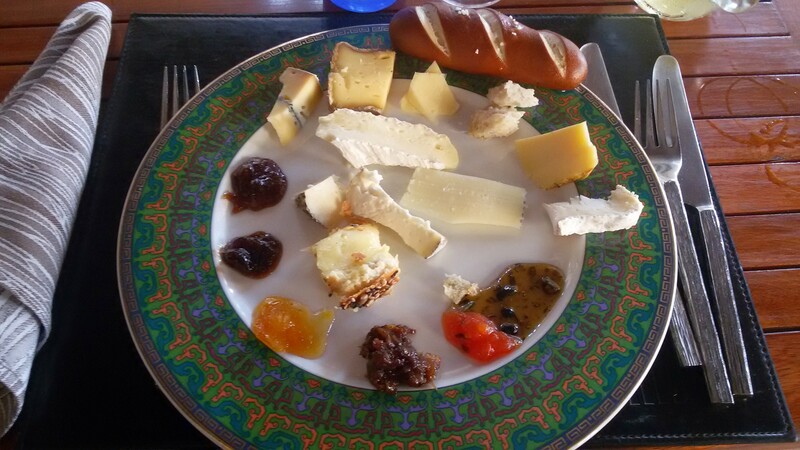 The cheese board at Al Qasr contained no less than a dozen different types of cheese: cow, goat and sheep; soft and hard, creamy and crumbly, sweet and salty. Sadly, in my eager anticipation of the tastes, I did not record the names. Maybe when someone offers to pay me to be a travel writer or restaurant critic these details will become more of a focus. In addition to the many fine cheeses, between each was a type of jam or chutney meant to compliment the flavor of the cheese. I picked up these as well, particularly being fond of the mixed berry chutney and the bourbon-bacon-onion jam (I’ll be working on a recipe for that as soon as I’m back where bourbon and bacon are legal). Beside the cheese board was a bread table with an equally large variety of crisp and soft breads, rolls and crackers to accompany the cheese. I chose a simple pretzel roll as a palate cleanser between cheeses. A nutritionist once told me that cheese activates the same pleasure receptors as opiates. This day I did not doubt it. My third plate went after the meats. There was a grilling station that had grilled lamb chops and grilled beef tenderloin (among other things). The lamb was… perfect. 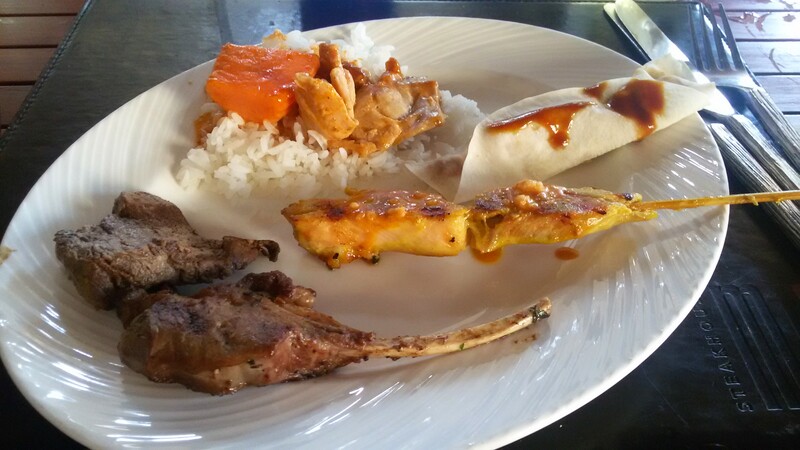 Because of the huge amount of dishes to try, I was usually taking only one or two small bites of everything (even those things served in small portions), but the lamb! I enjoyed down to the bone. The tenderloin was also delicious, and I also found some chicken satay (one of my favorite Indian dishes) and a new kind of curry that involved sweet potatoes, coconut milk and chicken that I dearly hope I will ever see in a restaurant again someday. Oh! and some Peiking duck, which itself is a dish that is not often seen let alone prepared well outside of gourmet restaurants in Beijing. A perfectly soft pancake, moist duck and a piquant sauce. Along side this plate, I opted to try one of the coconut concoctions. I really like coconut water, which, like so many other things is better fresh than processed in a bottle or can from the store. 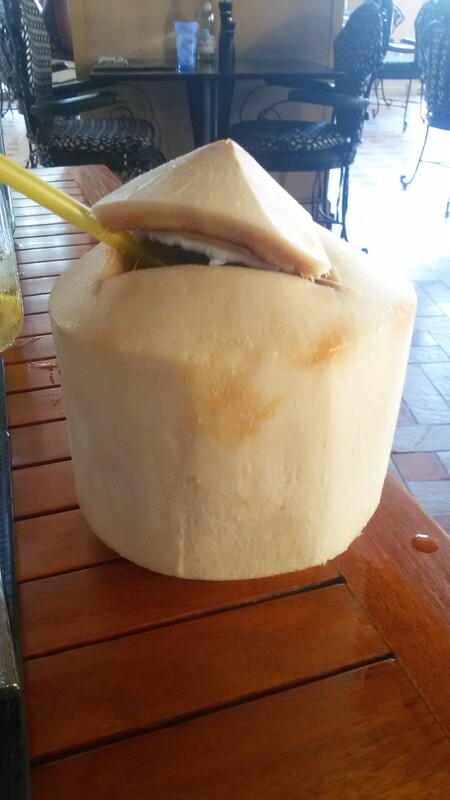 These young coconuts were cut open that afternoon, and just enough of the coconut water was splashed out to make room for the rum. It might be my new favorite cocktail, but I’m willing to bet its not as cool if you’re not sipping it from the coconut. I didn’t mean to have a fourth plate before moving on to dessert. In fact, given how beautiful the desert displays were, I was making sure to not stuff myself too full on lunch dishes (hence the one or two bites per dish strategy). However, I passed by a fresh pasta station. Short of going to a gourmet Italian restaurant or making it at home, one’s chances of enjoying really fresh pasta are far and few between. So I couldn’t pass it up. 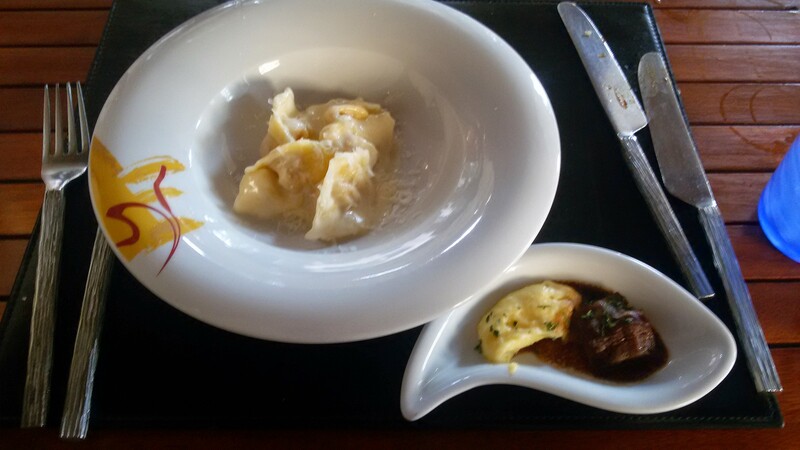 They had pumpkin, mushroom and spinach fillings for ravioli, and several types of sauce including cream, marinara and I believe a bolognese. I personally chose the pumpkin in cream sauce. If you’ve never had fresh pasta, and I don’t mean the stuff in the refrigerated section at the grocery store, I mean dough that was rolled out and filled a few minutes before it hits the hot water, you need to put this on your food bucket list today. Most of my life I only ever had dried pasta, and its fine. With a good sauce it can even be wonderful, but that’s really the point. Dried pasta is a vehicle for sauce. While fresh pasta is an amazing food that sauce compliments. And while I was there, I snagged a tiny dish of bite sized pot roast and mashed potatoes. I wish I could come close to describing all the food that was there. I inspected and passed over a whole station of “traditional” brunch foods like egg dishes, waffles, muffins and croissants. I walked past giant cast iron skillets filled with something that looked like jambalaya. There was a small infinity of South and East Asian dishes I vaguely recognized but don’t know the names of. I’m pretty sure even with four plates, I only tried less than half the dishes on offer. After about 2 or 2 1/2 hours of lunching (breaks to digest and sip prosecco between plates), I turned my attention to the dessert tables. I think there were probably 6-8 of these. One area focused entirely on chocolate concoctions made with Lindt chocolate. And the other was more fruit oriented with tarts, pies and fresh fruit. In a best-for-last strategy I decided to start with the fruit station. Beginning with the white and orange dish and moving clockwise: A coconut pudding with mango sauce, the little orange ball is actually a ball of cream dusted orange resting atop a waffle cone cup filled with raspberry compote, the glass dish contains a mint-chocolate mousse with little crispy decorative bits and a fresh raspberry, a strawberry tart with a cream base and fresh berries, a chocolate caramel macron with gold flecks, the most amazing lemon tart (only thing on the plate that got finished), a mini waffle cone with caramel mousse, some kind of fresh fruit – it was the only one on the table I didn’t recognize so needed to try, it was very tart and a little slimy, and finally a mini soda bottle filled with a fresh strawberry syrup. This plate went quite well with the mojito I picked up, lest I be remiss in failing to avail myself of a mojito station. The fresh mint and lime flavors complimented the fruit desserts perfectly. The second dessert plate, and final plate of the three and half hour brunch experience was focused entirely on chocolate. I should point out that while the staff did a great job of making sure that the tables were always full, some of the desserts I saw at the beginning did disappear or get replaced by the time I got to the chocolates. So, if I go again, I’ll be sure to snag anything that particularly catches my eye early on. A tiramisu the bottom layer of which may traditionally be lady fingers, but was dark chocolate cake in this case; a truffle cake lolipop, a pot-de-creme of blissfully creamy milk chocolate, a kind of salted caramel chocolate cream pudding thing (turned out to be my favorite, just lightly salted and a gorgeous blend of caramel and chocolate) with crumbled gingerbread on top; a pistachio chocolate truffle (green); a German torte with a nut filled dark chocolate dense bottom layer and a creamy white chocolate top layer; a white chocolate covered date; some white chocolate with candied ginger painted red and gold. At six o’clock we have the darkest chocolate cake with deep dark ganache frosting; a little piece of gingerbread drizzled with chocolate; tied for second place with the chocolate bottomed tiramisu is the molten chocolate tart (kept under heat lamps at the buffet to stay warm and gooey); a Lindt truffle cupcake; and in the center a masarpone cream delight with chocolate and fresh berries. Someone brought me a delightful and much appreciated cup of coffee with fresh steamed milk and options of white and brown sugar cubes (and it looked like good turbinado brown, not the silly repainted stuff). And I moved onto the main patio with a view of the Burj Arab and the boats carrying visitors by in the Al Jumeriah canal system. The staff were relentlessly polite without being in any way overbearing. Finished plates were removed, but only once one had set them aside or made some other clear signal. Glasses were kept filled. After any dish that involved finger food (like my prawns) a small dish of scented water and a hot towel were provided. At one point an American gentleman who seemed to be management of some kind (dressed in a white suit instead of a uniform and clearly supervising staff) asked me about my experience at the restaurant and we chatted long enough to connect over both having family in Austin. And although the food and beverage stations closed at 4pm, many patrons had plates of goodies and a remaining cocktail or two on their tables which we all continued to enjoy for at least another hour as the staff cleaned up and continued to ply us with complimentary water, tea and coffee (common in America, but not elsewhere, so it was a pleasant surprise). In fact, so relaxed and full of champagne and delicious food were we all, that I met a lovely trio of ladies who entertained me for the rest of the day and well into a fun-filled night, but that is another story. December is major holiday celebrating time for me. Most westerners celebrate some version of Christmas/Yule and the New Year, and of course Americans have Thanksgiving at the tail end of November. On top of that, I’m a Sagittarius, so I get to throw a birthday celebration into the whole mix. Saudi celebrates none of these things. Not even birthdays. Islamic New Year was in November (tho it changes on the Gregorian calendar every year) and they celebrated by fasting for three days. I was lucky enough to have an impromptu Thanksgiving feast, and you can read about my Christmas here. New Year’s celebrations are sadly out, since it’s on a Wednesday, and we work Sunday to Thursday. But my birthday goshdarnit, I could do something about that. I decided to treat myself to a champagne brunch in Dubai. And since I was there, to take in some other sights as well. I started my explorations bright and early Friday morning at the Miracle Gardens. This is a huge garden filled with structures made entirely of flowers. It’s actually very affordable, merely 30 AED (about 8$ US). 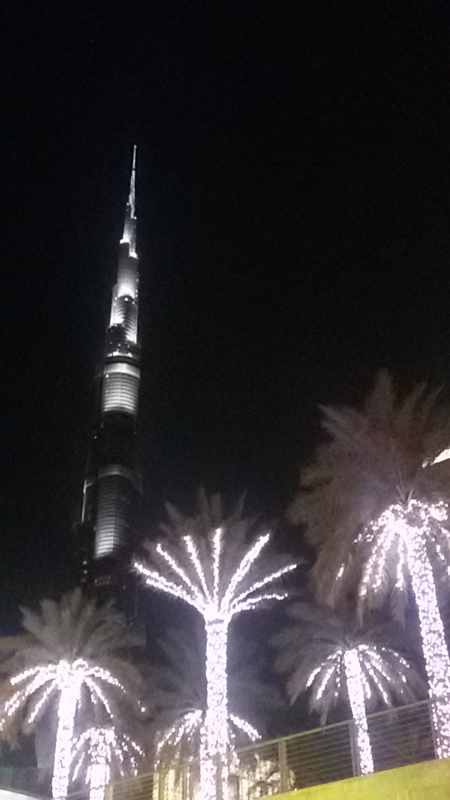 And like all things in Dubai, I’m sure it’s the most, biggest, -estest of it’s kind in the world. I spent the better part of three hours wandering the grounds, which even in December were quite warm in the sun. Every turn brought new views of the staggering flower creations. 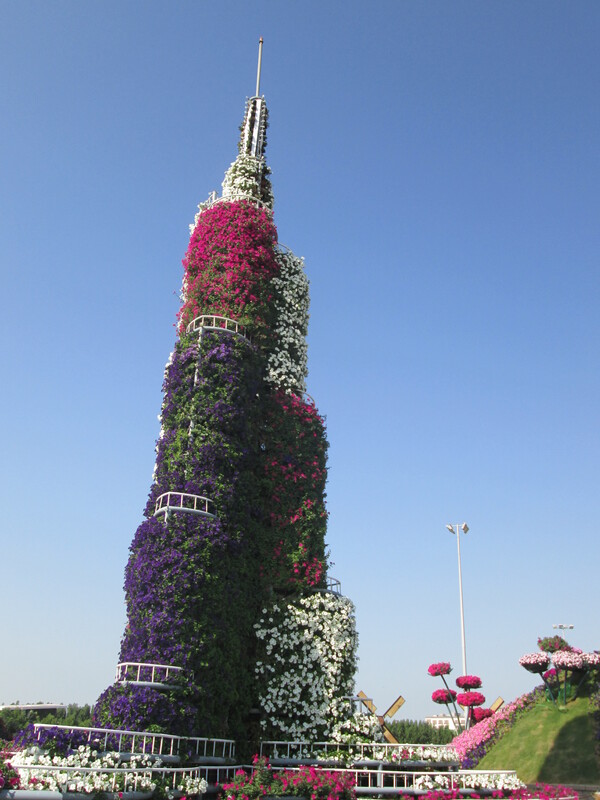 A village of flower houses, a tunnel of flower hearts, a giant flower clock, a princess tower, a river of flowers, bowers and bells, and even a floral Burj Kalifah (the tallest building in the world also in Dubai). The air smelled wonderful, and all the staff were amazingly friendly and helpful, constantly offering to take pictures for me so that I could pose next to the floral architecture. There were several pagodas and gazebos where people could rest in the shade and a generous but not overbearing snack center. This was ceilinged by a carpet of flowers providing shade, perfume and beauty while also preserving the all flower panoramic view from the central hill. The snack center offered a wide array of snacks from countries near UAE, and several dishes I’d never heard of. Because of my brunch buffet plans I didn’t sample any of the fare, but others seemed to be enjoying it, and it was nice to see snacks that weren’t merely pizza, burgers and fries. I was also told that they’re working on a “phase 2” which will be the world’s largest live butterfly garden if/when they can get the permits. So I’m keeping my eye out on that one because 35 thousand butterflies would be SO COOL. It wasn’t very crowded in the morning, but became more so as it crept closer to noon. It was very difficult to take wide shots without people in them, but unlike Saudi, that’s ok. And everyone was very considerate about taking turns to pose and take photos at the best spots. The garden is only open in the cooler months (hardly surprising given that no one wants to do anything outdoors in the summer in Dubai), so plan your visit accordingly. I could go on about the astonishing architecture, the magnificent scents, the colors and sheer volume of flowers, but in the end, pictures do speak louder than words, so please take a look at all my photos over on my facebook page, and keep a look out for the rest of my exciting Dubai December adventures!